Die Old School Renaissance war stark auf Google+ vertreten, das aber in absehbarer Zeit eingestellt wird. Damit kein Wissen verlorengeht, haben sich nun einige Leute die Arbeit gemacht, alle ihnen bekannten Blogs in einer Tabelle zu sammeln und als OPML zum Download bereitzustellen. Das OPML lässt sich in nahezu allen RSS-Readern importieren. Wer also seine OSR-Quellen aktualisieren möchte, hat hier eine gute Möglichkeit. Dieser Beitrag wurde unter Rollenspiel abgelegt am 10. Oktober 2018 von belchion. Letzten Monat war im Karneval der Rollenspielblogs das Thema Piraten, aber irgendwie habe ich den Monat verpasst. Damit die Leser meines Blogs nicht darunter leiden, gibt es nun aber doch die Kurzfassung zum Thema Königreiche der Piraten oder, genauer gesagt, einen Hinweis auf eine Youtube-Serie namens Extra History. Einmal die fünfteilige Serie „Kingdom of Majapahit – An Empire of Water“, welche die Geschichte des indonesischen Königreichs Majapahit beschreibt. Sowohl in der ersten wie auch in der letzten Folge wird beschrieben, wie dieses Reich Piraten nutzte, um seine Macht zu stabilisieren. Außerdem die Folge „Cheng I Sao – Pirate Queen“, in der es um eine chinesische Piratin geht, die eine derart mächtige Flotte aufbaut, dass sie mit deren Hilfe schließlich zu einer wichtigen Politikerin im kaiserlichen China wird. Insgesamt kann ich Extra History als Hintergrund-Lieferant für Rollenspiel-Kampagnen empfehlen. Sicher, sie liefern keine tiefschürfenden Informationen, aber sie sind äußerst unterhaltsam und fürs Rollenspiel reichen ihre Videos als Hintergrund vollkommen aus. Dieser Beitrag wurde unter Rollenspiel abgelegt am 7. Oktober 2018 von belchion. New week, new adventures and two new characters! The city has put out a bounty on reports for the road to the south, which is plagued by bandits and orcs. Even more bounty for removing any of those bandits or orcs. There was an attempt by the army to seize the orcish watchtower, but the tower was to well fortified and the strike force returned home after only exchanging a couple insults with the orcs. La Fleur found a black wooden plate with the letters ‘RSVP’ engraved when she returned. One of the brewers and his family has been found drowned and robbed. Both La Fleur and especially Noggin were keen on slaying enemies, and thus decided to go after the goblin cave where the group was defeated during the first session of this campaign. They gathered a little information, and went to ambush the goblins that were themselves ambushing travellers. They easily found them, and Jalosch snuck on them, while Jang-Chi (unwillingly) distracted them as lonely traveller. The goblins were surprised, went away screaming, but the group ran them down merciless. With a fury born from desperation, the goblins defended themselves and wounded Jang-Chi (badly) and Noggin (slightly) before they were killed. The group followed the tracks, which Jalosch could easily read, and found the clearing which lead to the cave. Different than last time, the clearing was adorned with rotten goblin heads on pikes. Those were the goblins which helped the group against the hobgoblin in session one, and were punished for their mutiny. Jalosch snuck next to the cave wall behind the cover of some shrubs, to get a view of the cave itself. He was so careful not to be noticed that he failed to find the cleverly laid traps and first fell into a hole before being swung up by a snare. The goblins left the shrubs there on purpose: Only enemies would attempt to sneak up to the cave, allies would simply follow the well trodden path over the clearing. The shrubs invited enemies to sneak among them, basically funneling them into the trap, which would then expose them for target practice. Jalosch dangled in the air, losing his dagger in an attempt to free himself. All the while, one goblin took shots at him while another frantically hit a gong to sound an alarm. Jang-Chi and La Fleur ran to help Jalosch, while Noggin stroud into the middle of the clearing, purposefully drawing the attention of the goblin archers. I had the player roll a deception check against the goblin’s passive perception (9), which he passed critically. Thus, both archers ignored their orders and concentrated on Noggin instead. The group returned fire and sought cover, except for Noggin who simply rushed forward. After a little while, a hobgoblin, three wolves and five more goblins came out of the cave, attacking the group at once! The wolfs tore into La Fleur and Jalosch, who both went down (Jalosch permanently). Jang-Chi killed two of the wolves with H’ruruzat techniques, while La Fleur dispatched the last with point blank magic missiles. Noggin was standing in the creek right before the goblins and the hobgoblins, and heard the axe calling to him: ‘Release your fury, and wash your enemies away! ’ He did so, and created a giant wave that swept the hobgoblin back into the cave, not to be seen again, but felt exhausted afterwards. The fight continued badly for the group, in the end, only Jang-Chi was still standing, badly wounded, but with all enemies defeated. Luckily, La Fleur woke a short while later and helped him drag Noggin to safety. Everything looked like a TPK when Jang-Chi (with very few hit points left) was alone fighting two goblins, but luck was on his side when a hit only reduced him to one hit point, and he finally won. The players of La Fleur, Jalosch and Noggin frantically rolled their death saves, hoping to get on their feet again with a natural twenty, but only La Fleur rolled one, and only after Jang-Chi had already defeated the remaining goblins. Jalosch had bad luck and rolled three consecutive failures, which meant he had bled to death during the fight. On their last leg (and even without looting the battlefield), the group retreated to Lowangen to lick their wounds. Dieser Beitrag wurde am 8. September 2018 von belchion in Rollenspiel veröffentlicht. Schlagworte: spielbericht. After some weeks without playing, we finally continued our journey through Adventuria. The journey into the Finsterkamm was rather calm, nothing much happened. On their way to Hiltorp, the group saw a burnt corpse and found a tree that was strangely fallen onto a ridge nearby. They found nothing at the tree, which seemed just a natural occurance, but when La Fleur attempted to identify any possible magic on the corpse, she was almost roasted from within. The dwarves are plagued by orcs and ‘traitors’, dwarves who do not accept the sovereignty of the king in Finsterkoppen. A gryphon called Garafan is said to nest within the mountains. The dwarves do not particularly like him, but the church of Praios considers him holy. Observe the spring before drinking from it. If you see animals drink from it, and the picture you see in the water looks like the animal, it should be safe. Or you can try to leave a gift for possible water spirits overnight, if they are gone the next morning, you should be careful. There is a place called ‘Nimmerquell’, who is rumoured to be home to a powerful nymph. The group set out to Nimmerquell, hoping to aquire the hair they were looking for at that place. On their way, they passed the spring of the Black Svelt, where a pack of wolves drank. When looking at their mirror images, the lead wolf looked strange, and the group gave them a wide berth. They later learnt that they had seen the nymph Nieijaa, who had a crush on red haired humans. A little while later, Nadia found a group of dwarfs preparing an ambush. The group decided to spy on those dwarfs to learn what they were up to and learnt they were waiting for orcs whom they did not particularly trust, but were said to bring important goods from the Rorwhed. It also turned out that one of the dwarfs had cut a locke of hair from a nymph, which had caused nothing but trouble for the dwarfs. The group decided to ambush the ambushers, which resulted mostly in a lot of waiting. Finally, a combination of clever ideas, good luck and a high damage critical hit at the right time resulted in the dwarfs withdrawing. I had the dwarfs roll a morale check after they had clearly witnessed magical capacity on part of the group (and owl causing an avalanche) and also Noggin impersonating a golem on his sneak attempt (OK, that was more Noggin critically failing his sneak attempt) and afterwards slaughtering one dwarf with a single hit plus Magic Fire. Noggin managed to tame the dwarven burden rams, which carried a lot of food, and they group set out to find the nymph the dwarfs had been spoken for. This worked rather easily, again with help from Nadia the Owl. After climbing a waterfall with a Spider Climb from La Fleur, the group finally met a very devastated nymph called Fomes of Finsterkamm, daughter of Krenä and learnt that any changes made to a nymph’s hairstyle were permanent, as nymph’s were eternal. Also changes to the nymph also change the water they live in, as was witnessed when a part of the lake started to glow after Fomes intertwined a locke from Noggin into her own hair. but where death lingers, live may return. and from beauty other beauty may return. Thus ended this adventure, and will hopefully continue more regularly again. Dieser Beitrag wurde am 7. 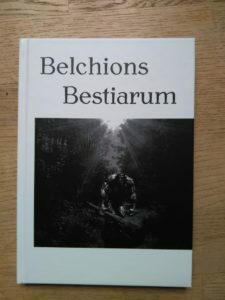 September 2018 von belchion in Rollenspiel veröffentlicht. Schlagworte: spielbericht. This week ended in an catastrophe, with nearly everyone rather disappointed. The group rested, with seemingly everyone reunited. In reality, Tapio had been replaced by a Doppelganger who had tricked him into entering one of the cells. I did not think it would cause a lot of problems, as the players had announced they were returning there to free the prisoner, and I had Tapio’s player simply play the Doppelganger. During the rest, Dargoth was target of several accidents, and finally had enough of it: He set the whole ruin afire, and the whole group left. After the next rest, Tapio was suddenly gone, with only the tracks of a giant snake remaining. The group rushed back to the ruins, but found only Tapio’s corpse in one of the cells. The wyfwolf and the prisoner had perished in the other cells. Afterwards, Dargoth attempted suicide by wrestling with a kraken beneath the kitchen and diving through the exit afterwards, but extremely well medical aid by La Fleur saved him. The group returned with a horribly broken Dargoth to Lowangen. They also carried Tapio’s corpse all the way, to ensure his proper burial (which even Black Jandora attended). When you identify the throwing knife, you always get the ID of the spell ‘Magic Missile’. The piece of wood has some kind of spatial magic that twists within itself. The axe has a strong affinity to water and wind, when you touch it, you feel as if a wave washed over you. They sold the throwing knife to the Grey Staves, but kept the axe and the piece of wood, as La Fleur was curious what they might do and did not trust the Grey Staves to handle them properly. Also at the Grey Staves, they met Noggin, an old aquaintance of Agdan Dragenfeld who decided to join them. Noggin had a short adventure before meeting the rest of the group, where he investigated a severe lack of beer just before the carnival. He found it was caused by another group of adventurers with to much money on their hands, who intended a prank and paid him with some liquor not to reveal anything. When the other party revealed their prank and offered the whole beer for free for all attendants at the carnival, La Fleur got extremely suspicious, and could only be talked down by Noggin. The next day, they set out together to find the hair of a nymph for the witches, hoping to find a pure spring in the Finsterkamm. Dieser Beitrag wurde am 1. September 2018 von belchion in Rollenspiel veröffentlicht. Schlagworte: spielbericht. Die Herbstlande fielen mir auf, weil das Buch ein so wunderschönes Titelbild hat. Als der Herr Low mir dann noch sagte, dass es darin um märchenhafte Fantasy geht, habe ich es quasi sofort gekauft. An guten Stellen kommt es an Ronja Räubertochter, Alice im Wunderland, die Geschichten von Michael Ende oder Andersens Märchen heran, mit einer unglaublich leichten, aber doch kraftvollen Sprache und einer fantastischen Welt mit fremdartigen, feenhaften Regeln, die so gar nichts mit der typischen Fantasy zu tun hat. Obwohl es in dem Buch um schwere Kost geht (um Abhängigkeit, Schwäche und Selbsterkenntnis), die mich teilweise sogar arg mitgenommen hat, lässt es sich unglaublich angenehm lesen. Ich kann daher sehr gut verstehen, warum diverse Fantasyautoren sich bereiterklärt haben, an einer Anthologie zu anderen Ereignissen aus den Herbstlanden mitzuarbeiten. Leider verliert es an einigen Stellen im Oktober diese Leichtigkeit, wirkt regelrecht gequält. Die Rettung von der Gegenspielerin des Oktobers fühlt sich falsch an, als ob jemand anderes tut, was die Heldin tun sollte, und auch das Schicksal der Gegenspielerin fühlte sich überstürzt an. Als ob jemand diesen Teil in die Geschichte hineingezwungen hätte, obwohl er nicht mehr ganz passte. In diesem Kapitel wird der Heldin vieles von außen zugetragen, was von innen kommen sollte. Auch die Sprache wirkt in diesem Bereich eher staksig, verglichen mit dem Rest der Geschichte. Meine zweite Enttäuschung war das Ende, wo die Heldin ihre Veränderung erzählt anstatt sie zu zeigen: Hier etwas mutiger gekürzt und die Geschichte hätte profitiert. Dennoch, ich habe dieses Buch mit Genuss gelesen. Die Schwachstellen dieses Buches liegen immer noch auf dem Niveau guter Fantasyliteratur, einzig im Vergleich zu den noch besseren Passagen des Buches fällt die Fallhöhe auf: Sie sind nicht schlecht, man merkt nur am sonstigen Niveau der Erzählung, dass sie noch besser sein könnten. Wem die Monster und NSC in meinem Blog gefallen haben, dürfte auch dieses Buch mögen. Ich kann es daher guten Gewissens zum Kauf empfehlen. Es gibt noch einen Zusatzband, das Reisejournal, den man für die Geschichte aber nicht braucht. Ich überlege, ihn mir noch nachträglich zu kaufen, da er angeblich noch mehr Überraschungen aus den Herbstlanden enthält. Dieser Beitrag wurde am 31. Juli 2018 von belchion in Rollenspiel veröffentlicht. Schlagworte: fantasy, Rezension. Dieses Jahr habe ich auf dem Weg zur Feencon die Anthologie Sternmetall – Bulgarische Phantastik aus dem Verlag Torsten Low gelesen. Mein Eindruck von diesem Buch ist etwas zwiegespalten. Einerseits waren es nicht die klassischen Fantasythemen, sondern leicht ungewöhnliche Ideen, auch der Schreibstil war in Ordnung. Ich konnte das Buch während der Bahnfahrt gut weglesen. Besonders die Geschichte Sternmetall, die auch der Anthologie ihren Namen gab, wartete mit einer fremdartigen und doch vorstellbaren Welt auf. Andererseits fehlte allen Geschichten das gewissen Etwas. Sie fühlten sich nicht wirklich wie Geschichten an, sondern mehr wie eine Aneinanderreihung von Ereignissen. Auch dies wird in Sternmetall am deutlichsten, wo die Hauptfigur im Grunde nichts tut, außer zweimal (davon einmal auf Aufforderung) zu singen. Insgesamt bleiben alle Figuren eher blaß, es gibt keine Konflikte oder Unsicherheiten, an denen sie wachsen oder sich verändern könnten. Besonders in der ersten Geschichte wird dies deutlich, wo die „unerwartete Wendung“ im Nachhinein als für die Hauptfigur äußerst konfliktreich beschrieben wird, nur in der Geschichte selbst nichts davon durchkam, weil der Autor sich zu sehr auf die (von mir als erste Lösung ins Auge gefasst und daher erwartete) „unerwartete Wendung“ fixiert hatte. Man kann dieses Buch lesen, es ist OK, aber es hat mich nicht mitgerissen und daher kann ich es nicht guten Gewissens zum Kauf empfehlen. Dieser Beitrag wurde am 22. Juli 2018 von belchion in Rollenspiel veröffentlicht. Schlagworte: fantasy, Rezension. Tunnels leading north and south through the center. Tunnels leading north and west. A Tunnel leading east toward a broken door. He also figured out that he was not lifted when he activated the mechanism, but instead was spun arround very quickly, disorienting him. He was unable to find Tapio again, despite several tries, and followed the marks Dargoth had left during the game before toward a door behind which he heard furniture being moved. Dieser Beitrag wurde am 8. Juli 2018 von belchion in Rollenspiel veröffentlicht. Schlagworte: spielbericht. Again, the group delved into the dungeon and considered using the title theme from Scooby Doo as guideline for their actions. The group returned to the great storage room through the dungeon and searched it for treasure, finding mostly foodstuff, but also a snuff box, a golden amulet, a silver amulet (which, when identified showed as magic void), and some minor trinkets. The silver amulet burnt the werewolf, but did not change her form, and also did not prevent Dargoth from casting spells when he wore it. The group attempted to rest in the storage room afterwards, but was disturbed by a bat flying in, diving for their camp fire! Luckily, La Fleur nailed it with a Magic Missile before it came into contact with the fire. Even though everyone but Dargoth acted before the bat, nobody was able to hit it. La Fleur, the last to act before the bat, decided to Magic Missile it to circumvent the bad luck with attack rolls. Which was quite overkill for a completely ordinary bat, but the results speak for themselves. When Roderick investigated the most sincerely dead bat, he found a small pouch with a horrible balm bound to its leg. Dargoth later recognized the powder as an instant demon, which would arise if the balm is set aflame. They decided to put the balm into the empty snuff box and gave it Roderick for safekeeping. Afterwards, they considered setting a trap for their enemy, but finally decided against it as they considered it to risky during night. Instead, they pressed on through the dungeon in a hope to bring the fight to the enemy. They returned to the kitchen where they removed the stove from the well. An eerie light washed over the slain and already partly scavenged giant rats, and La Fleur smashed and burnt the corpses just to be safe. Once the stove was removed, Tapio was sent scouting into the well, where he found a tunnel which lead to a room with a shelf, many bones and a cleaver. The others followed, and only Dargoth awakened whatever lurks deep in the well, but it was probably sleepy as it just tugged at the rope with a tentacle and then retreated again. This was a great amount of luck for the players: Not only made most of the group extremely good stealth rolls, but their opponent also rolled very poor. There were two exits from the room, one west and one east. The group headed east, and quickly came to a T-section. They heard howling from the north, noticed they had left the hogtied wyfwolf in the kitchen, and decided to go south till they got to a crossing. Dargoth found tracks leading west, and Roderick a strong curving wall to the east. The group parted, with Dargoth and La Fleur following the tracks, while Roderick and Tapio inspected the curved tunnel. The tunnels led on for some time, in a sharp bent. After a little while, they reached a crossing, the curved wall continued beyond, but one could also go north and south. Tapio remained at the crossing, while Roderick went a little south till he reached yet another crossing. Once he stepped into the middle of the crossing, one could heard a loud clanking sound, while dust filled the air. Roderick quickly jumped forward and ended up in front of Tapio, even though he had jumped away from him. Roderick afterwards followed the curved tunnel and finally appeared behind Tapio. Meanwhile, La Fleur and Dargoth had followed the tracks and reached a door. They could not hear anything behind the door, and opened it. Behind, they saw an extremely cramped storage room full of furniture and, hardly to be seen, a leg beneath one of the furniture. Dargoth went in to investigate, suspecting foul play, and was right: The bones started moving once he looked at them. La Fleur dashed in as well to help him, but her magic did not do any damage, while she was hit by two attacks and lost conciousness. Dargoth hardly noticed this, as he smashed his way through the skeletons without taking damage. This fight should have been easy, but the dice had conspired against La Fleur: Not only was she attacked twice, but both of these attacks hit with and one even hit critically. This caused sufficient damage to reduce her to −1 hit points, which meant that she was at 0 hitpoints, unconcious and had to roll death saves. Then her luck returned though, as she rolled a 20 on her very first death save, which caused her to regain 1 hit point and get back on her feet, where she could even cast an (albeit unsuccesful) spell. Dargoth and La Fleur decided to prepare the cramped room as a resting space, while Tapio and Roderick were still puzzled as to where they were. Dieser Beitrag wurde am 3. Juli 2018 von belchion in Rollenspiel veröffentlicht. Schlagworte: spielbericht.